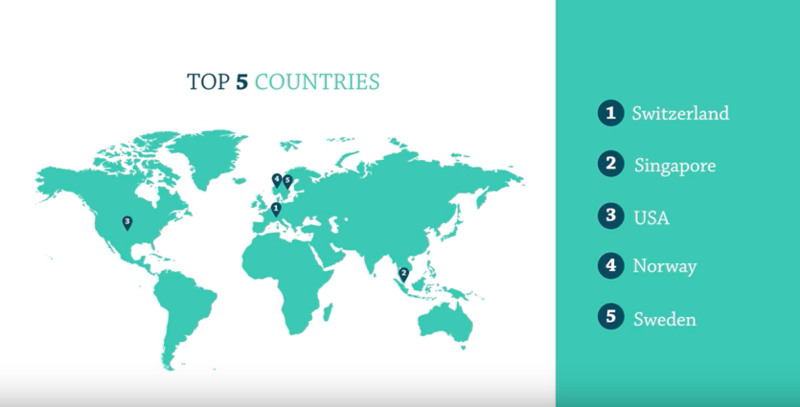 These are the countries that are the best at attracting, developing and retaining talent. When it comes to making a country, a city or an organization competitive, there’s an essential ingredient – people. 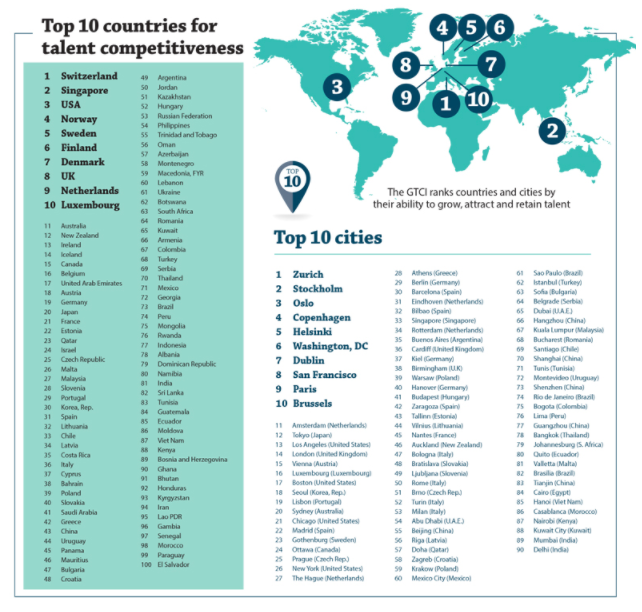 For the last six years, the Global Talent Competitiveness Index (GTCI) has ranked countries and major cities on their ability to attract, develop and retain talent. GTCI is an annual benchmarking report compiled by international business school INSEAD with The Adecco Group and Tata Communications. It measures and ranks 119 countries and 90 cities based on their ability to grow, attract and retain talent. Here’s a closer look at the places that came top in the 2018 ranking, which was released at the World Economic Forum Annual Meeting in Davos. “Enable” looks at the regulatory, market, business and labour landscapes and whether they help attract people, or put them off. “Attract” assesses how open a country or city is to outside talent – whether that’s people or businesses – and also to those from underprivileged backgrounds, women and older people. “Grow” examines how well a country or city develops its people, for example, through a good education system that offers lifelong learning. “Retain” looks at how nice it is to live there; one of the main components of talent retention is quality of life. “VT Skills” measures the availability of workers with vocational and technical skills. “GK Skills” looks at the availability of global knowledge skills (workers in professional, managerial or leadership roles). First-placed Switzerland performs strongly over all six pillars, but is particularly good at retaining talent, and offers “an ideal economic environment in terms of its regulatory, market, business and labour landscapes”. Next is Singapore, which comes top in the Enable category for its ability to attract talent from abroad. The USA is in third place, performing particularly well in the Grow pillar. This is due in part to its leading network of universities and the opportunities for career development. As a result, the US has an outstanding pool of Global Knowledge Skills. Offering access to social protection and benefits and a good lifestyle, Norway, like Switzerland, excels at retaining talent. Sweden performs well across all six pillars, but is especially good at retaining talent. In the Global Cities Talent Competitiveness Index, cities are measured using the same first four pillars as countries (Enable, Attract, Grow, Retain) with the addition of a new pillar: “Be Global”. This reflects the feeling of internationalization within a city. Europe sweeps the board, with Zurich, Stockholm, Oslo, Copenhagen and Helsinki taking the top five positions. 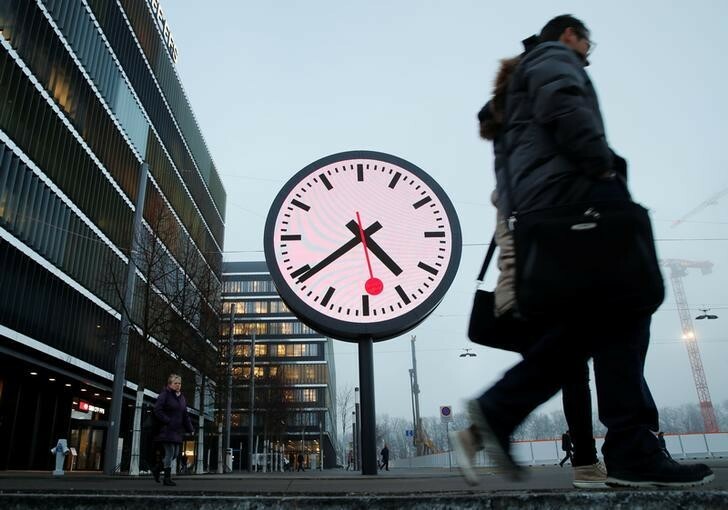 Zurich does particularly well at attracting talent, thanks to the city’s good quality of life and international feel. Out of the top five cities, Zurich scores highest on Be Global. Stockholm scores highest on the Enable pillar, which explains the presence of many Forbes Global 2000 companies in the Swedish capital. Oslo and Copenhagen both receive high scores on Attract and Grow thanks to their high quality of life and abundance of major universities. Meanwhile, Helsinki does well on the Retain pillar, helped by a high doctor-patient ratio. What are these places getting right? The top performers have four key traits in common. These are: an education system that looks ahead to the needs of employers and adapts accordingly; a business and regulatory landscape that is flexible; a working environment where employees enjoy flexible working and receive social protection; and governments that foster openness. The top five cities offer great quality of life, good education systems and business environments with a global feel. Employees also have opportunities for development. But there’s also plenty that these places are not getting right. Even those highest in the index do not perform consistently, especially when it comes to diversity and inclusion. Switzerland, for instance, is criticized for not having enough female graduates or women in leadership positions. The US has a great pool of talent, but is less tolerant of minorities. Nordic countries rank very highly for social mobility and gender parity, but lag in attracting foreign talent and developing multicultural societies. The report warns that, in today’s unstable and fast-changing world, having access to a good pool of talent is not enough. Countries and cities need to put more effort into making sure that talent is diverse and have to show a commitment to developing a culture of inclusion. “People do not just need to be different, they need to be fully involved and feel their voices are heard,” says the report. The report admits that achieving diversity is not easy, and requires commitment. It might even disrupt social cohesion and make managing people more complex.